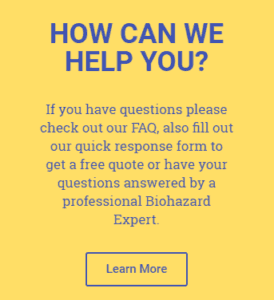 As a professional biohazard cleanup company, frequently our job involves taking care of a property after someone has died. It can be from things such as a fatal crime scene or an unattended natural death of person who lived alone, but sadly all too often it is due to a suicide. And it doesn’t appear that the need for our services is going away any time soon, since the rate of suicide in the U.S. is increasing rapidly. Despite a focus on prevention, the rate of suicide in the U.S. has been steadily rising across the country, increasing 25% between 1999-2014. According to the CDC, in about half the states, the rate is over 30%. The risk of suicide among vets is more than 20% higher than for civilians. Mental illness is not the only cause. A CDC study revealed that 54% of suicide victims had not been diagnosed with a mental health issue. Ongoing depression may be the cause in a significant number, but taking a look at recent deaths of high profile celebrities who seemingly had fulfilling lives (or so it appeared) has forced a reconsideration of intervention efforts. There is no typical suicide. It cuts across gender, ethnic, educational, and socioeconomic lines. Veterans Crisis Line: 1-800-273-8255 (Option 1); or text 838255. The VA also has online chat help available for servicemen and women, vets, and those who love them. Though we are here to help in the aftermath of suicide with trauma counseling and cleanup, we would be very happy when the day comes that our services related to this matter were no longer needed.